�����Dealers and collectors have been converging on Chicago for this week�s World�s Fair of Money. Activities in the windy city began with the much anticipated sale of the 1804 Dollar in Heritage�s Platinum Night. �����Platinum Night always contains the very best and rarest that numismatics and Heritage has to offer; and this night was no different. Even with so many amazing rarities up for auction, the focus was still on the Mickley-Hawn-Queller Class I 1804 Dollar, certified by PCGS as PR62, which sold for a house record of $3,877,500. This is the only PR62 available, although the highest certified of this date is PR68. �����Whenever a coin of this magnitude headlines a major auction it can benefit other coins in the sale. One such rarity was the 1795 $10 Gold 13 Leaves in NGC MS65; this is one of four certified in this grade (NGC and PCGS combined) and it brought $675,625. Below is a list of some other outstanding rarities from this Heritage Sale. �����The rest of this week should be just as exciting with a long list of dealers attending the largest ANA event of the year along with Stack�s Bowers Auction. As usual, the ANA will be hosting numerous educational seminars, exhibits, and activities all relative to numismatics. Visit the World�s Fair of Money website for more info; the official convention program is online and includes a map of the biggest bourse of the year, a full schedule of events, an in-depth look at the rarities in the Museum Showcase, and more. 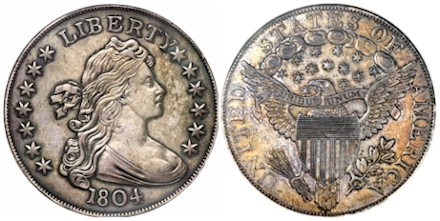 �����The Stack�s Bowers Auction contains many specialty collections, highlighted by the sale of the 1792 Half Disme with a long pedigree tracing back to the first director of the U.S. Mint, David Rittenhouse. Check out a full list of the coins available at the Stack�s Bowers Galleries website. We should have some prices realized from the auction in our next report. 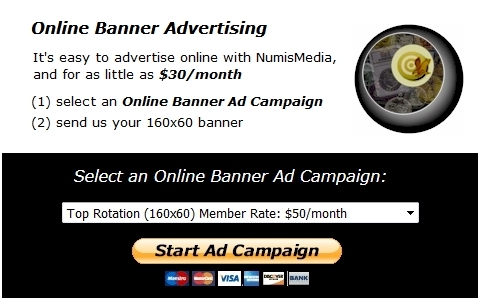 �����Many dealers have been focusing their attention on Seated material the last several weeks and we have noted advances throughout the charts. In this week�s LD Wholesale Market Dealer Price Guide there are many changes in Half Dimes and Dimes with most of the increases in grades MS63 through MS66. �����In Half Dimes, the 1840 No Drapery in MS66 climbed to $3,450 Market and the 1847 in MS66 moved up to $2,200. �����Within the Seated Dime chart, the 1839 O in MS67 advanced to $11,500 Market and the 1856 Large Date is now listed at $13,500 in MS65. 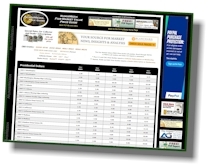 �����We have just added a new feature to our online price guides. Graphs for current and past FMV and Plus prices can be accessed for free by clicking a price within the online collector price guide charts. Analyze historical pricing trends, and compare adjacent grades for every date, in every series. 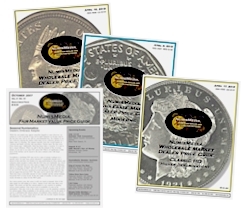 Price history graphs are also available for all of our guides (Market, FMV, CAC, Plus, PCGS, and NGC) for NumisMedia Members and Dealer Subscribers. �����A minor social media milestone to announce: the following tweet is #100 for @NumisMedia (it is also our first embedded tweet). �����We have been upgrading our internet servers for the last few days. We should not experience any further downtime and our migration and upgrade should be complete by the end of day. Hopefully the inconvenience has been minimal.